Drizzy Drake just pulled a Yonce' and released what he is not calling an album- If You're Reading This, It's Too Late mixtape. It appears this is his first mixtape in almost 6 years. This is the usual heavy melodic and lyrically engaging sound we've grown to expect from Drake. The mixtape was dropped on the web last night to many surprised fans, only days after he dropped the short film, Jungle. It's very easy to assume the mixtape was released for many reasons. Many are assuming the cover itself explains it all. 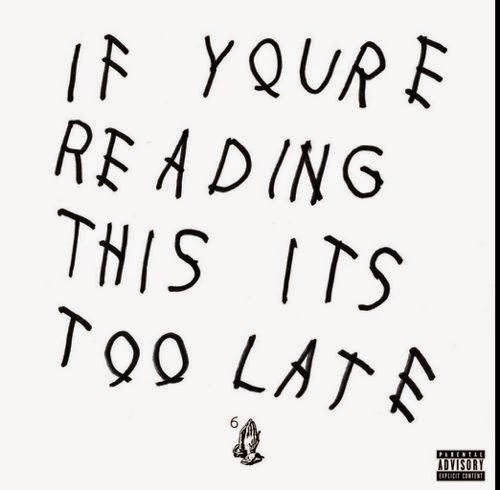 The cover art is "If You're Reading This, It's Too Late" scribbled across a white background. As most know there is definitely some drama at Drake's label CMB. With Wayne recently pulling away from his long ties with Baby and CMB, there is speculation that Drizzy is trying to do the same. Drake was under a four album contract with CM. I wouldn't be surprised if this surprise album he's calling a mixtape with the shady title is him fulfilling that fourth album and chucking the deuces to CM too. Wowzers. Of course Tyga didn't like that. He almost immediately took to his twitter account and responded by saying Drake shouldn't sneak diss. He told Drizzy to meet him in the streets, and that he (Drizzy) has been dodging the fade from Tyga's bff Chris Brown. What CB has to do with this, I'm not sure... but I guess we all like an amen choir. This surprise release is quite genius for all of the reasons it could have dropped as it did. I personally don't care about the beef part, but this is hip hop and if you call anybody out you have to be ready to get called out. It is also worth mentioning that Drake dropped the mixtape just as Diddy was ending his epic concert at Madison Square Garden. Some felt like the timely release of the mixtape took all of the attention from Drake's rumored rival's concert...yet another jab. If I am right about this, Drake just pulled off one of the biggest overall disses in Hip Hop. As my Muffin would say... oooop! L.o.l. We did have the mixtape streaming below, but IF YOURE READING THIS, IT'S TOO LATE! LOLOL gotta get it off of itunes.